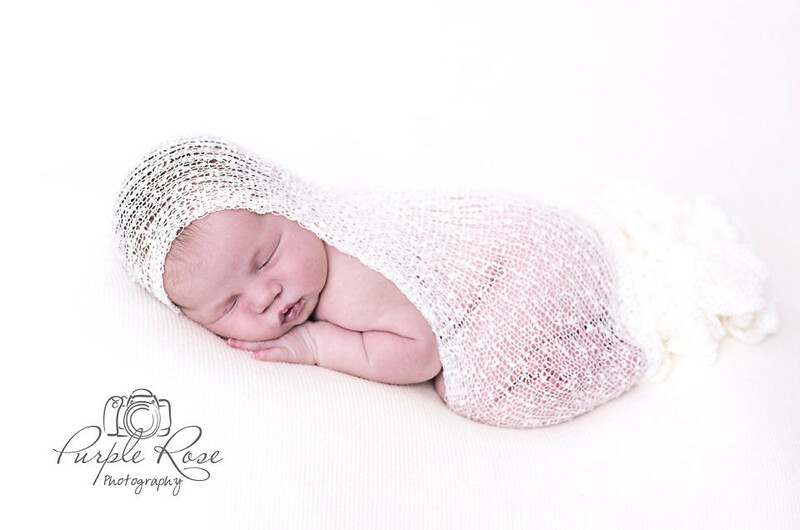 What happens at your newborn photo shoot? questions. After answering any initial questions you may have I will email you my helpful guide on how to prepare yourself and your baby. This covers how to relax your baby, so they are nice and sleepy when they arrive at the studio. As you can see, sometimes baby just wants to be awake, no matter how comfy we make them. The photo shoot its self will last between 2-4 hrs. It all depends on how relaxed baby is, I will never rush the photo shoot. If baby needs to stop at any point we stop. Be that to feed, have a cuddle or even just have a fidget, we work to your babies schedule. It has never happened to me before, but if baby is really unhappy and not settled we may need to reschedule for another day, I never want baby to be unhappy. Once everyone is settled into the studio, I would suggest giving baby a little top up feed. This ensures they are nice and sleepy and comfortable. 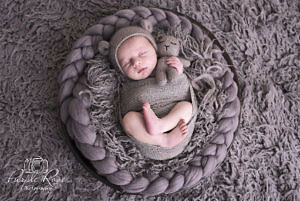 The room will already have been heated up to ensure babies comfort, you will probably find the room very warm so I always suggest dressing in layers. Once baby is ready we will then place them on the bean bag and get them settled. This is usually when babies decides to have a toilet break, don’t be embarrassed, or worry about the props, I fully expect this to happen. For your peace of mind, all props are washed before your session to ensure they are clean. 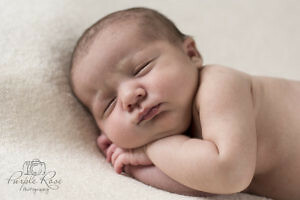 Once baby is settled I will then begin working with them to produce images you will treasure. I always ask that one parent act’s as a ‘spotter’ for baby to ensure their safety at all times. You will be asked to assist me in moving baby, to minimise disruption to them and and to support their head during certain poses. I love it when parents bring special toys or outfits to the studio. This little ones Grandmother lives abroad and upon hearing about the photo shoot had this beautiful outfit posted over in time. I’ve also had toys or outfits passed down from previous generations, or specially made for baby. I can incorporate any special interests into the shoot for example sports, if we discuss this at the time of booking it gives me plenty of time to plan. So bring any special items along and we’ll experiment and see what works on the day. So what happens after the shoot? After you have left the studio I save the images in a couple of locations for safe keeping. Once edited you will be invited back to view and select your images. There are no nasty surprises here, you will have already been issued a full price list beforehand and I will help you narrow your choice down to your selected budget while recommending ways you may wish to use the images at home to display them. Once you have selected your images I will complete my final edits and order any prints or albums you have requested. If you have selected an album I will ask you to approve the layout before I place the order. Once received I will check your products before contacting you to arrange delivery or collection. I am a huge believer in printing your photos. Anyone who has been to my house can confirm it is filled photos, canvases and albums. Maybe it’s because photography is my passion but I feel there is something special about printing and displaying your images, its just never as good on screen. Whether I provide professional printing services to you or you order elsewhere I always encourage clients to print their images. I love to see what my clients do with their images, so if any of you are reading this please let me know.